As window cleaners, we are required to continually work with glass suppliers to ensure we are up to date with the latest glass technology. One type of glass which is becoming increasingly common in Sydney homes is Low E Glass. It’s made the same as standard glass but has a thin metallic oxide film fused to one side of the (usually facing inside) and this can be an inexperienced window cleaners worst nightmare. The glass was originally used in commercial office buildings due to it’s ability to increase energy efficiency (reduces heat loss) and is starting to become a popular choice for residential setting (especially new homes built in Sydney’s North Shore) due to it’s ability to reduce the amount of UV rays, heat and glare coming into the home when compared to standard glass. Follow this process for to remove dust and fingerprints. Never allow the low E coating to come into contact with metallic objects (blades, watches, rings, scourers etc) as it can leave behind deposits which show up on the glass as stains or scratches. Simpo cleaning works with builders and glass suppliers on a regular basis, in fact they hire us to clean all their windows during the post builders clean. Hi – have just installed $25k worth of windows and doors all with eVantage low e glass by Viridian and we absolutely hate it! Any tips on how or if it can be dissolved/taken off ? It looks grimy and and is so reflective we can’t we the views outside properly. Terrible product. You won’t be able to remove it because the Low-E coating is fused / laminated onto the glass during the manufacturing process. Unfortunately, you’ll have to either live with it or get them replaced entirely. The grime can be taken off using some acetone and a lint free cloth. Hi, same issue as Jane we have the E glass windows installed. We had them cleaned post build which has left all types of marks and scratches on them. I’m now looking for a business who understands the cleaning process and can get them looking new! At the moment we only serve the Sydney Area. You should speak with the cleaning company which caused the damage as it’s their responsibility to fix an issue which they caused and a homeowner who paid for a service shouldn’t have to waste their own time worrying about it. 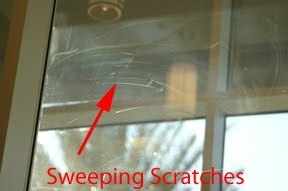 More than likely the windows are already damaged beyond repair if the cleaners used any sort of blade or squeegee on them (the coating is very sensitive and can be damaged by the slightest contact with metal objects). The cleaning company should pay for a replacement if this is the case. Traditional windows can be repaired using an abrasive paste and polisher, unfortunately, you can’t do this with Low E.
We have low e glass and it doesn’t come up clean! We can see the round suction marks from the manufacturing process and there are now streaks where kids have run their fingers in the condensation. Any tips? Is it just something we have to live with? I think what you mean is that there are stains caused by the suction cups which were used during the window installation process (not manufacturing). This is something we encounter from time to time during after construction cleaning and we’ve had success removing it with a little acetone on a soft lint free cloth. You can try 99:1 Water and hydrochoric acid if acetone doesn’t remove it. Not sure how long you’ve had the windows installed, but you should bring it up with the builder if the marks don’t come off after cleaning as they are usually considered a defect (this is because low e glass manufacturers don’t recommend the use of suction cups during installation unless no other option is available since it’s possible that the suction cups can cause irreversible damage to the coating of the glass, especially if they haven’t been cleaned with denatured alcohol beforehand). In regards to the streaks, you can just clean these off with acetone or denatured alcohol. Use 10 parts water to 1 part vinegar to clean and maintain it on a weekly basis. NEVER use regular commercial window cleaning products like blue windex or ammonia to clean low E glass as these can damage the coating. We come across this almost on a daily basis as we get a lot of work from builders. Acetone is the best remedy for it. Just apply a bit on a lint free cloth and it should start to come off. Also works for removing silicone residue. This will mean the job will also take a lot longer (depending on how much adhesive is left on the glass) so you need to charge accordingly. Thank you, thank you. I was ready to pay to have my very large mirrors cleaned. But, instead, I tried your method even the water and vinegar solution. I will never buy the blue stuff again. My husband even noticed how shiny and streak free my mirrors were. I am getting black marks which won’t come off (kind of looks like charcoal stains) on my low e glass. Any idea what could be causing this and if it can be removed? Black stains on low e glass can be caused by contact with any sort of metal (eg. the use of metal scourers, kids resting metal objects on glass etc). We’ve had success removing these marks by using a 100:1 water to hydrochloric acid solution and a lint free cloth. I have a similar problem to Wynand. I am also a South African window cleaning company. we clean houses that have many square meters of e glass, am I correct in understanding that we cannot use a squggee on this glass. I also believe that some of the window installers, install the glass facing either interior or exterior direction, I have found that some of the glass feels rough on the one side and smoother on the other side, does this indicate which side the oxide coating has been applied, and which side should face exterior? According to some articles I have read, the glass should have the characteristic’s of Pinkleton glass, which indicates a specific facing side to interior and exterior. The side with the low e coating will feel rough (this is usually facing inside) and this is the side you will need to be careful with. The side WITHOUT the oxide coating can be cleaned as normal with a squeegee. The side with the coating can be cleaned with a lint free cloth and stains can be removed with the help of a little acetone. Thank you for the messages, all so useful. I have low e glass. in the process of repairing my thatch roof, splashes of rubberized bitumen landed on the outside of the glass. My glass is installed correctly with the low e on the inside. How can I clean these black spots off the glass.